This website features megalithic, Early Christian, medieval and fortified sites we have visited around Ireland. This year we added sites to three different counties. Please check back as we add pages for these locales. A huge thanks to Marcus for all his help with our latest clickable MAP. There are two ways to navigate the site. To the left is a list of counties in Ireland. Each county name expands to a listing of (clickable) sites in that county. The links in the header (top of the page) lead to alphabetical lists sorted by type of monument, all of which can be clicked to take you right to the listed site. We have also added a map featuring Ireland's Round Towers to our Early Christian pages. 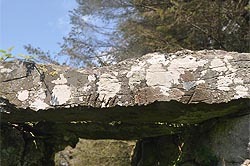 The ogham stone page is continually updated and the High Cross section of this site can be accessed separately. We hope you enjoy your exploration of our site, and we welcome your comments! Please respect that great effort is made to bring you high quality images to aid in locating the most important features of a site. These images are copyrighted and are not be used without the permission of the photographers. Thank you! Last updated 20th Apr 2019. Latest updates: Wicklow: Hollywood. Wexford: Hooks Bullaun. Kildare: Ballymore Eustace graveslabs. Monaghan: Edergole. Laois: Errill Church. Cork: St Anne's Church. To be added: Cavan: Moybologue, Loughanleagh, Gallon and Raffony. Wexford: Killag and Grange. Meath: Dowth Tower House. Kildare: Reeves. Kilkenny: Inistioge, Thomastown, Clomantagh Church and Tullaroan Crosses. Westmeath: Fore crosses. Tipperary: Roscrea. Important Copyright Notice! Sadly it has come to our attention that certain websites have been using our images without our permission. Any use or reproduction of our photos without permission of the photographers is strictly forbidden.